Chen Xiang (birth and death unknown) was famous for painting landscapes by his left hand. Chen Xiang (birth and death unknown), who was alternatively called Zuo Bi Shan Ren, was a native of Hangzhou, Zhejiang Province. He was famous for painting landscapes by his left hand. 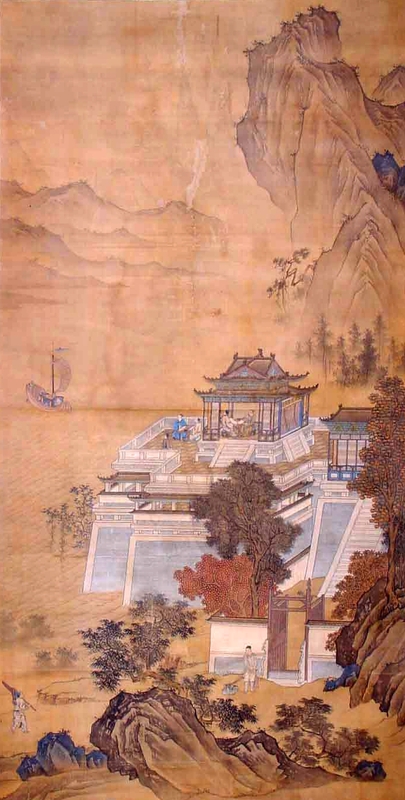 In this painting, there is tall pavilion by the sea painted meticulously and in detail. Foot-ruler was used to paint the pavilion building's scanning lines -- neat , accurate,delicate, elegant and in rich color. The stones and mountains were painted in the style of the "Zhe school". An inscription on the right side with "He Ting Ren", and "Zuo Bi Shan Ren" sealed in intagliated characters. 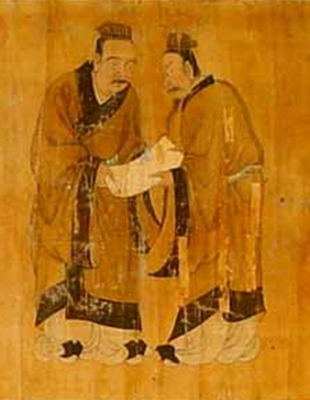 Wen Zhengming (1470-1559) was the representative of "Wumen School", and one of the "Four Masters of the Ming Dynasty". Wen Zhengming (1470-1559), original name Bi, who styled himself Zheng Ming, and was alternatively called Hengshan Jushi, was a native of Changzhou (now Suzhou, Jiangsu Province). He was the representative of "Wumen School", and one of the "Four Masters of the Ming Dynasty". He specialized in figures, landscapes, flowers and birds, especially got outstanding achievements in landscape paintings, which mostly described the theme of Southern landscapes. His representative work is Zhen Shang Zhai (hand scroll). 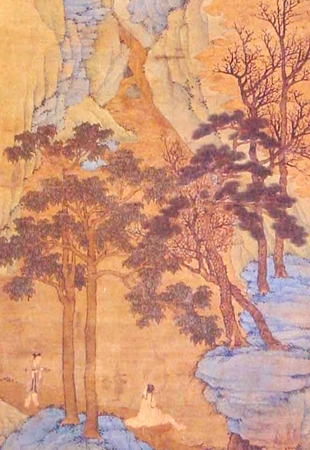 The spring mountains in the painting were painted in mineral green and umber, with inscriptions of the sayings sung by Zhou Fu, and one poem "Southern Spring" by Ni Yunlin, and seals in intagliated characters "Zheng"and "Ming" . Shen Zhou (1427-1509）,was a native of Changzhou (now Suzhou, Jiangsu Province), and the founder of the "Wumen school"
Shen Zhou (1427-1509）, who styled himself Qinan, with the alternative name Shitian, and self-claimed as Bai Shiweng (Bai Shi old man), was a native of Changzhou (now Suzhou, Jiangsu Province), and the founder of the "Wumen school", and also one of the "Four Masters of the Ming Dynasty" (Shen Zhou, Wen Zhengming, Tang Yin, and Qiu Ying). His painting works had two kinds: brush and refined brush. His style was powerful, refreshing, and more pedantic and he was the representative of the Ming Dynasty's paintings by scholars and officials. This painting shows the quiet valley and deep lake, with peace and tranquility.. The mountains and rocks in this painting are dominated by outlines with applying colors and the colors are mineral blue and mineral green --bright but not tacky. 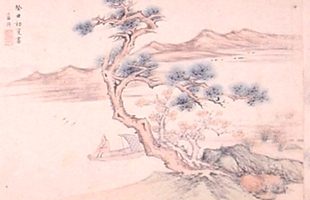 The branches were drawn in bold brushwhich shows the vigorous artistic conception. The leaves were drawn in outlines, and the color was dyed in vegetation green--the calm color. On the top right corner of the painting, there is a self-titled poem. 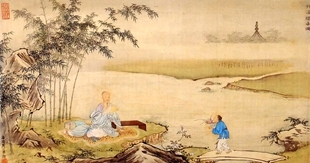 Wu Wei was a court painter of Ming Dynasty, and the founder of "Jiangxia School". Wu Wei (1459-1508), who styled himself Ciweng, with the alternative name Xiaoxian, was a native of Jiangxia (now Wuchang, Hubei Province). He was a court painter of Ming Dynasty, and the founder of "Jiangxia School". He specialized in painting figures, landscapes, especially in outline drawing without color or shading. He started painting in court in Cheng Hua period (1465-1487). In Hong Zhi period (1488-1505), he gained the emperor's royal seal, and was called "Master of Paining". His personal style was mainly evolved from the Southern Song academic tradition, and his figure painings were divided into bold free style, meticulous style and traditional ink and brush style. His early style was delicate and exquisite , after his middle age, his style was characterized by greater freedom and more expressive brushwork. The representative of his works is Wind and Snow on the Ba River Bridge. 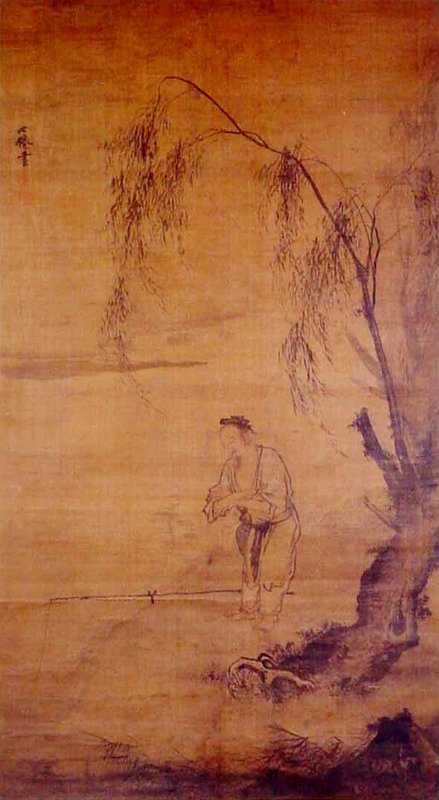 In this painting, the figures' faces, hands and feet were outlined with light ink and light colors, and the method of the composition was taken from the style of Southern Song Dynasty's "side corner" method, but his own style was characterized by fresh brushwork instead of Southern Song's calm and vigorous style. 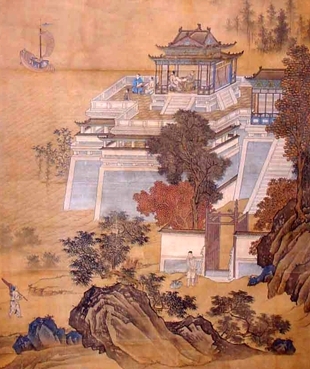 The upper left corner of the painting was signed "by Xiaoxian", and a seal of "Jiangxia Wu Wei" carved in relief can be found below it. 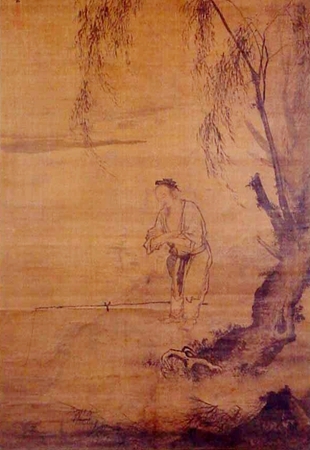 Dong Qichang (1555-1636) was the representative of the "Huating school", and the leader of the late Ming Dynasty paintings. Dong Qichang (1555-1636), who styled himself Xuanzai, with alternative names of Sibai, Siweng, and Xiangguang Jushi, was a native of Huating (now Songjiang, Shanghai). He was the representative of the "Huating school", and the leader of the late Ming Dynasty paintings. He specialized in landscape paintings, which were in subtle elegance and vividness. He promoted paintings by scholars and officials, and had a significant impact on the paintings of Qing Dynasty. Both of the emperors Kang Xi and Qian Long liked his calligraphies and paintings, so his paining style was strikingly rife in the whole contry during that period. This painting was a joint work . 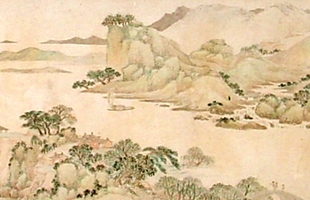 The first part depicts the landscape with self-titled "Native Land of Reeds in Autumn" by Dong Qichang. Later, another inscription was added by Chen Jiru, saying that it was better to be titled as "Native Land of Perches". Since then, Zhuang Yan, Zhu Nianxiu, Li Shaoji, Chen Lian, Shi Jiaohuan, Lan Ying, Wu Zhen continued to add something to the painting, and there is an inscription of the year "Gui Chou (41st year of Wan Li, 1613)" signed by Lan Ying, and "Ren Zi (40th year of Wan Li, 1612)" signed by Wu Zhen. Yu Zhiding (1647-1716) was a court painter in Qing Dynasty. He specialized in painting figures. Yu Zhiding (1647-1716), who styled himself Shangji, and was alternatively called Shenzhai, was a native of Jiangdu (now Yangzhou, Jiangsu Province). He was a court painter in Qing Dynasty. He specialized in painting figures. His representative wark is Sitting in the Quiet Bamboo Grove. This painting depicts figures finely and delicately, with vivid expression, and the patterns of clothes are smooth and natural, with clear and bright color in the setting. This scroll is the paining of the statues of the disciples of Confucius, 59 statues in total. They were painted in ink, with vivid color, and the characters were with different postures. This scroll is the paining of the statues of the disciples of Confucius, 59 statues in total. They were painted in ink, with vivid color, and the characters were with different postures. On the scroll there is a rectangular seal of the 3rd year of Shun Zhi period (1646) of Qing Dynasty, which was the Qing Dynasty's imperial palace collector’s seal, and there is also an inscription by Emperor Qian Long. This scroll was recollected by the royal court during Qian Long period of Qing Dynasty (1736-1795). 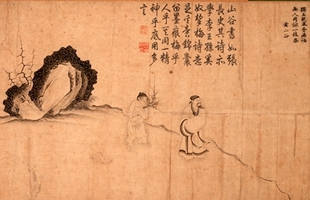 An excerpt of a postscript by Jiang Pu can be found at the end of the scroll. The collaborated postscript by Wang Jie, Cao Zhi, Peng Yuanrui, Dong Gao and others is found nest to it. , By careful examination of the contents of the scroll, the characters in the paining were considered as disciples of Confucius.